A small, unobtrusive and adorable utility follower with useful abilities and able to wear helmets! Unpack all the files in your Skyrim/Data folder. 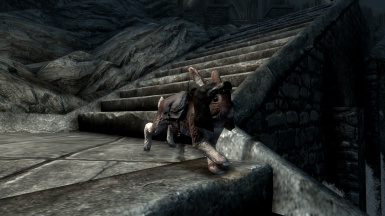 Sir Dovahbit of Caerbannog is the ultimate support pet! He is no ordinary rabbit! He's small and doesn't get in the way, perfect if you need someone to carry your stuff but find companions too annoying and big. He won't fight but rather run off to do his own things when you are in combat. He knows you can handle it and doesn't want to ruin your fun. He's a great companion for stealth characters, he'll never initiate combat and has a very high stealth rating. You can even use him to lure enemies! He doesn't mind. You can order him to steal things and empty containers for you! Just make sure the owner doesn't see you and he won't suspect a thing. He's the ultimate follower to all the alchemists out there! Simply command him to harvest ingredients on your behalf and he will gather FIVE times as many ingredients from a single source! He's an animal follower, so you can have another follower at the same time. He has a tiny magical bag where he stores all the things you give him! 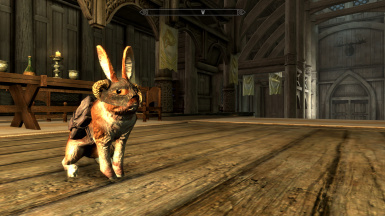 Dovahbit was once the most powerful mage of all times untill he accidentally transformed himself into a rabbit and... started to enjoy it a little too much. Now all he cares about is seeing new places and eating carrots. Dovahbit is extremely powerful and extremely lazy, don't expect him to help. He's got better things to do! Dovahbit can defeat Alduin with little effort, but he always gets distracted and forgets about it. Dovahbit does not mind getting shouted off cliffs, he finds it amusing. 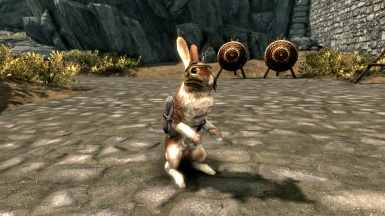 Dovahbit does not care if people laugh about him, he knows he could vaporize them in an instant. 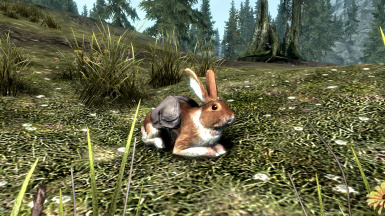 Dovahbit is aware of how adorable he looks. Dovahbit was once thrown off the Throat of the World by the Greybeards for eating all their food. 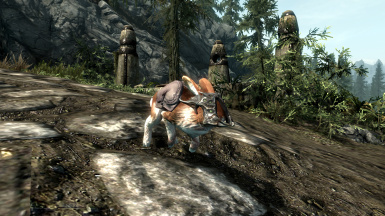 Dovahbit claims he was Tiber Septim's pet. Dovahbit has been an assassination target for the Dark Brotherhood 547 times. Dovahbit always gets all the ladies; do not bring him with you at the inn. Dovahare is Dovahbit's apprentice. She wasn't particularly excited of being transformed into a rabbit. 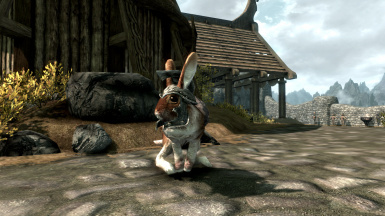 She had been asking her master to turn her back for the first few years and eventually just kind of gave up since Dovahbit is unable to pay attention to people talking to him for more than 5 seconds straight. She's diligent and a "party pooper" [quot. Dovahbit] and has been with her master for a few hundreds years by now. Maybe. She kind of lost count. A: Make sure you don't have any other pet follower with you. in the console and talk to him twice. If that don't work, you might have a follower mod that is not compatible. Starting a new game might work as a last resort, but no promises. Q: I can't trade with him! A: You have a follower mod that is not compatible. Q: Aside from hats, will he be able to wear other things in the future? Q: Something doesn't work / is buggy / I can't live without my other companion mods! What should I do? 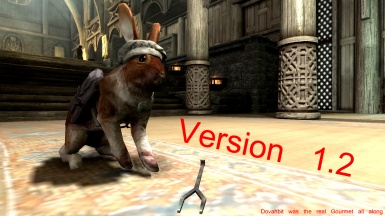 A: Most of the bugs, known issues and compatibility problems are not present in the alternative version of the mod, Dovahare. Look in the optional files. He is not fully compatible with follower mods such as UFO and AFT. If you have any of the sort, make sure you load dovahbit.esp BEFORE them, however, do not expect everything to work properly. 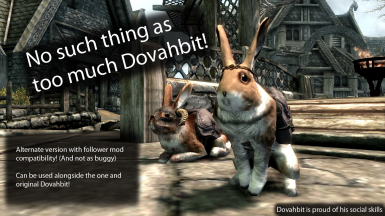 On the other hand, the Dovahare version is 100% compatible with follower mods!